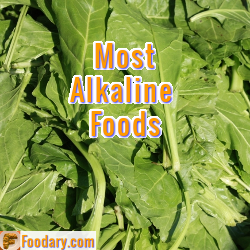 The alkaline vegetables list is presented in order of descending alkalinity (PRAL), but you can click column headings to sort by description or any nutrient. Note that the alkaline or acid effect of food is only one aspect of a healthy diet, so please click on the links within the list for a more complete explanation. Though I give exact numbers, all natural products have seasonal, regional, and other variations. Nutrients are also affected by cooking methods. Due to those inherent variations, no food chart of this type can ever be 100% accurate. But it does not have to be. The alkaline foods lists are good for assessing total diet, identifying weaknesses, and finding healthier options. As you can see, most vegetables from the key foods list, have an alkalizing effect on the body. If you have any questions about this Alkaline Vegetables List, please join the alkaline vegetables list discussion.